In 2015, DCP used community feedback from the 2014 Downtown Perception & Use survey and multiple community workshops to craft a new Downtown Action Plan to guide the next five years of downtown progress. An one-page summary of the Five-Year Action Plan’s goals and objectives may be found here. BIG GOAL #1: Downtown Wilkes-Barre will be a safe, clean, and attractive place to live, work, shop, and visit. BIG GOAL #2: Downtown Wilkes-Barre will be the region’s college neighborhood. BIG GOAL #3: Downtown Wilkes-Barre will be the region’s “walk-to-everything” urban neighborhood of choice. BIG GOAL #4: Downtown Wilkes-Barre will be the region’s “Innovation District:” its hub for business, startup activity, and entrepreneurship. BIG GOAL #5: Downtown’s historic architecture, walkability, riverfront, and colleges will be the cornerstones of its enhanced visitor experience. 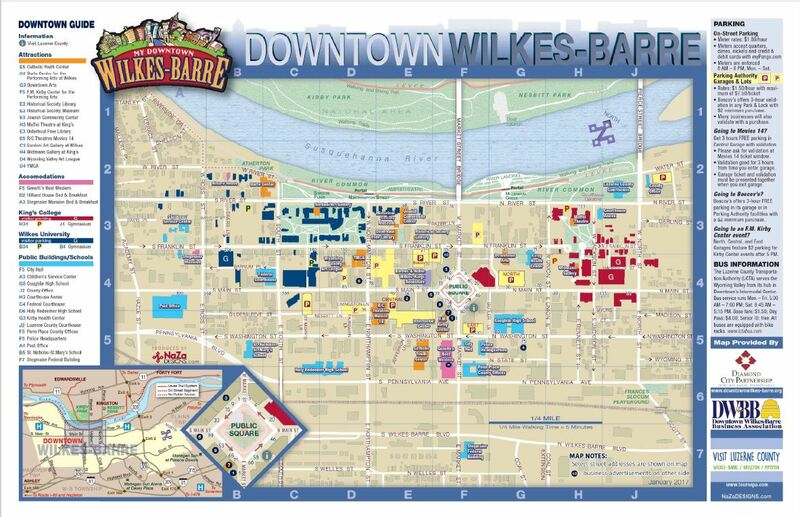 BIG GOAL #6: Downtown Wilkes-Barre will be a regional center of arts, culture, dining, and entertainment. The full plan, including supporting information, may be found here.